I've always treated pregnant ladies, and their babies too, even back when I was training as a reflexologist. It's an area of my work that I love as reflexology can bring so many benefits during pregnancy, and post-natally – check out my previous blog for more info on this. 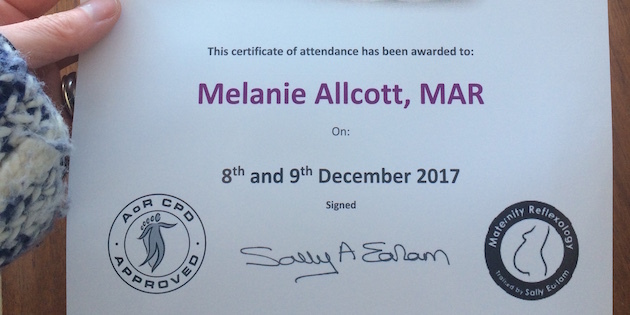 Always keen to develop my understanding and practice I thought it was about time to formalise my experience, so last week I went to London and trained with the AOR maternity guru, Sally Earlam. Sally is a wealth of knowledge and I learnt so much on her fabulous course which I'm really excited to incorporate into my treatments! I've now got three new maternity packages for expectatnt parents, Blossom, Bloom and Nourish, and Nurture for new mums. You can buy a package for yourself and they're perfect as a gift, perhaps for your partner, daughter, sister, colleague...? My website has more details and of course, please don't hesitate to get in touch if you'd like to find out more.